Now that my daughters are older, our holiday traditions have changed. While I mourn some of the things we no longer do, we’ve created some meaningful new traditions that fit our changing demographic. Kid #1: Nia is 21 with her own car, which means she could tell us, “I’m not coming home for Thanksgiving/Holiday break because I’m going ______________ with _______________.” That hasn’t happened yet, but it’s just a matter of time. Thanksgiving to Christmas whooshed by when I was young. Dad preparing the sermons for holiday services and my mom preparing everything else at home while working full-time. Year after year, we ate copious spreads of delicious food, argued about whose turn it was to open the Advent calendar (until they wised up and bought three), lit the Advent wreath, and searched the house for hidden gifts. Still, the meaning of these holy days was not lost on us. I felt appropriately thankful, awestruck, and joyous as we grew ever closer to Jesus’ birth. These days, my holiday season doesn’t much resemble my childhood. We don’t open Advent calendars every year. I have no idea where the Advent wreath is some years. We don’t cook nearly as much food, or the same foods, as I had growing up. I have a very different approach to gift giving than my parents did; we celebrate Jesus’ birthday on Christmas, and the gifts are to the Jesus that is part of us. What carries on is our love for each other: our little family of five is the most precious thing in the world to me. Preparing for Jesus’ birth is a reminder to us all about what it’s like to welcome such a miracle in to the world. Those feelings stayed with me all these years, and live on through our new family traditions. Thankfully, my husband David loves to decorate for the holidays. Now that Nia is gone until right before Christmas, he and the girls get the tree Thanksgiving weekend, so that we can all decorate it together. (Reminder: go water the tree.) It’s one of the new traditions we started a couple of years ago. We didn’t realize how important being together to decorate the tree was for us until the first year Nia wasn’t there. We talk about the ornaments as the girls hang them. I remind them about where, when, and who made which ornaments, or who gave which to whom. We argue about the details, we argue about the ones the girls feel are too ugly to hang. 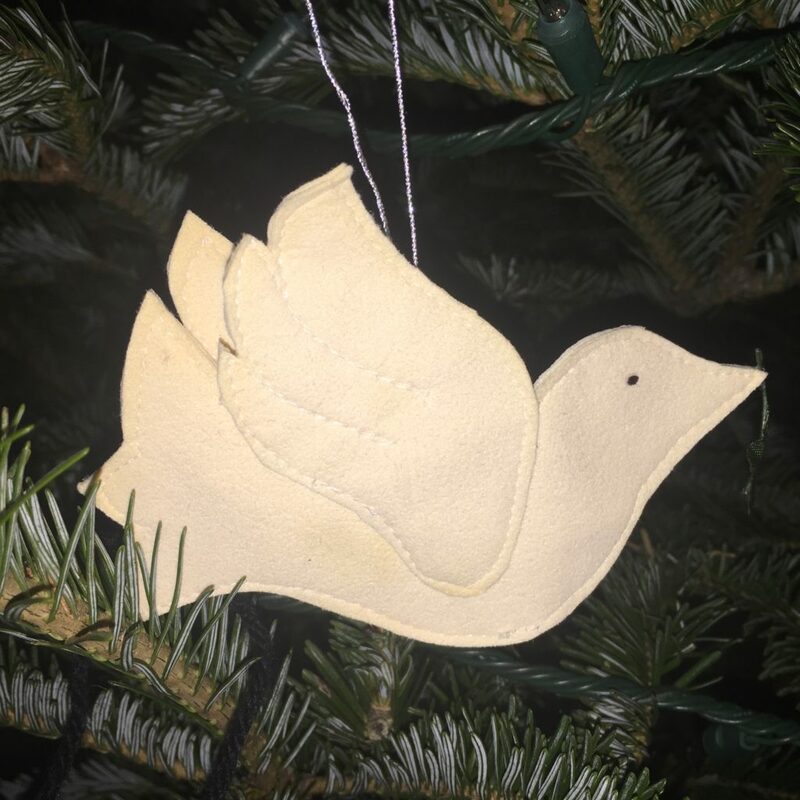 But I insist that all homemade ornaments have a place of honor on the tree, because they symbolize the light of Jesus flickering, burning and growing in them as they grew each year. Decorating the tree is such a tangible, visual way to connect the dots on why it’s important to prepare to witness the birth of our Savior, to see him as a little baby and know that so many amazing and wonderful things would happen. And so they do with my girls. We will continue to modify our traditions and create new ones. As the girls continue to grow, we’ll have to find new ways to do the same thing: celebrate the miracle that is the baby Jesus. Do your holiday traditions change as your family grows up? How? What an affirming essay. Thank you for reminding me that our family’s existing traditions are meaningful and can be enough just as they are. Thanks! I think Jesus would be okay with whatever way we find to honor him, that’s my hope. Within good sense and reason, of course! It’s so great to get this preview of life with a child out the door. I feel like I can’t do enough to get ready for the day my kids aren’t at home anymore. Thank you. You’re welcome as always! Keep blessing us with all your good works. It’s very different with them gone now … even though one and his wife live here in town. I don’t bake as much, and don’t feel the same tingle of anticipation that being WAY too busy and stressed-out provides. I spend a lot of time in an Advent frame of mind, because no one cares if I am doing any of these traditions or not. I do the ones I feel like doing and leave out things that I don’t feel like doing, and no one seems to notice. They are making their own traditions now. It’s their turn to decide what is important and make it all happen. I would add — if you are adult children of aging parents, you should ask your own parents this question about traditions and how they changed when YOU left home. You may find your parents were relieved to let some things go. You may find that they miss them since YOU went away. I’ll just say that it has become a very different season for us in the past five years or so since they became real adults with their own homes and partners. What a great idea! You’re so right. My mom is gone, but my dad lives nearby and loves to share, so we will certainly ask him.